Make sure every room in your home stands out with the products and services from our flooring store. When you are looking for luxury hardwood flooring, you are sure to find the perfect pattern and style when you shop with us. From engineered hardwood to solid hardwood floors, we feature a full inventory of classics. No matter what style you have chosen for your space, you’ll find a complete selection to enhance the look and feel of any room in your home or business. Stop in and visit us to learn more about our collection and installation options. Engineered Hardwood is great for any space. While hardwood is a classic and natural option for your home, not every room is right for this material. Bathrooms, basements, and other moisture-prone rooms are not ideal spaces for hardwood, as the humidity can cause the material to warp, bend, and peel. Fortunately, there is another option available for homeowners. With engineered hardwood, you are free to create a stunning and luxury look throughout every room, including bathrooms and basements. Engineered hardwood is real wood flooring that is built in layers and bonded together. Under the top layer are multiple layers of high-density fiberboard, which offer greater strength and stability than standard wood. This construction makes engineered hardwood resistant to damage caused by temperatures and humidity. Improve the distinctiveness or your space by choosing a fresh option for your flooring. If your goal is to create a warm and welcoming space in your home, handscraped hardwood lets you achieve your design dreams. The unique appearance of this durable material offers a distressed and one-of-a-kind style, making it the perfect way to create rustic residences. Each plank is scraped by hand so no two flooring patterns are the same. The uneven finish on handscraped hardwood looks unique under different lighting. From the morning sunrise to the evening sunset, you'll enjoy the natural beauty of handscraped hardwood during every hour of the day. As complicated and stressful as it is to shop for new flooring, it can be even more difficult to perform proper installation. In order to ensure that your hardwood floors are installed correctly, we recommend turning to a professional. At our store, our team is happy to help you throughout every step of the process. We perform full hardwood flooring installation that is completed correctly the first time. With us on your side, you never have to stress over confusing measurements, crooked lines, and other issues that require future repairs. A wonderful addition to your home, hardwood floors signify beauty and richness. Full of dramatic tones and grains, they radiate light and add instant style to the home. A popular choice, hardwood is selected by homeowners because it will last for years. When you need a durable flooring option, visit us to speak with our team. Whether you prefer light or dark hues, our collection of hardwood floors provides something that you will love. With eye-catching patterns and textures, each kind of hardwood flooring has a unique look. 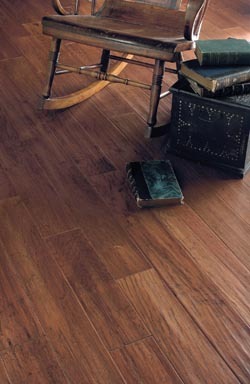 This quality flooring will work well in almost any room throughout the home. Since it is constructed using many types of wood species, it also goes with all sorts of decorating styles. Try it in the living room, bedroom, basement, or den. The choices are endless! Hardwood floors are easy maintenance. With all of the things you have to do during the day, keeping your floors clean should not be on your daily list of chores. From dust and dirt to liquid and smudges, any type of mess can be cleaned up quickly and easily. Most hardwood floors require very little maintenance, and they are easy to care for no matter how busy you are with your to-do list. Contact us today to shop for new hardwood flooring for your space. We proudly feature a full inventory of engineered hardwood and other products throughout Denison, Jefferson, Harlan, Lake View, and Carroll, Iowa.